Based on the late Patricia Highsmith’s story “The Price of Salt”, it is set in the 1950’s and according to all reports magnificently photographed by Haynes’ great cinematographer Ed Lachman. Cate can NOT and WILL not be ignored by the Academy if you want to know. Both she and Rooney Mara WILL be nominated for what evidently is being considered a tour-de-force by all and sundry. But who will go in which category? And does it really matter? Especially at this (very) early point in the Oscar race? I’m assuming “Carol” will go the tried and true Festival route. Telluride in August, Toronto in Sept. with New York’s Film Fest immediately following. And who’s deciding all this? Why its’ legendary Oscar Whisperer Producer Harvey Weinstein that’s who. And he’s slated the opening for Dec.18. So “Carol” and Cate and Rooney and Harvey, too, have a long row to hoe before “Carol” opens, and as we all know, some Cannes’ favorites can run out of steam by the time the actual Oscars role around. Witness last year’s “Foxcatcher” barely making it to the Big Night and coming up with No Wins. Guessing I would say that Rooney will be in the Supporting category and she could very well win there. 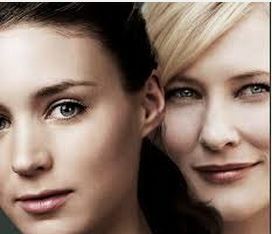 Even if she is a co-lead with Cate. Witness Patricia Arquette’s co-lead(she was the Mom) in “Boyhood” and won in Supporting though she could’ve been campaigned in lead. But her immediate switch to Supporting got her the gold, though the film won nothing else. I think the same will be true for Rooney Mara in “Carol.” Harvey is NOT putting Cate Blanchett in the Supporting category if he ever wants to work with her again. Blanchett I don’t think would stand for it. And neither would Academy voters. And what does the Cannes Best Actress Award and the Oscars have to do with each other anyway? Well, last year Julianne Moore won for “Maps to the Stars” in Cannes, but on Oscar night it was in “Still Alice” that gave Moore the gold, finally, after four tries. Cate has two Oscars, Rooney has none, and the Academy is Rooney-friendly, nominating her for “The Girl with the Dragon Tattoo” a few years back. And Harvey, as usual, has another Best Actress contender in the 19-year-old Saoirse Ronan for “Brooklyn”, also coming up this fall. And putting all three Weinstein women in Best Actress would be a big much of a much-ness. Wouldn’t it? Swedish/Drama Crime Drama “The Bridge” Season 2 Is Here!